No, I have not read Marx’s Theses on Feuerbach (or The German Ideology for that matter), though I really should. I am quoting from Muriel Barbery’s deliciously heady novel, The Elegance of The Hedgehog, which I have been reading for what seems like forever. It’s a dense delight for a lover of philosophy and of art, for those of us bitten by the bug of logolepsy and for anyone who enjoys their ontological theory served with a side of sardonicism as only the French know how to deliver. The title of this post is taken from the title of the preamble to Barbery’s novel and is a concept that has been on my mind all day. On May 23, 2014, Elliot Rodger, a now infamous 22-year old went on a murderous rampage at the University of California at Santa Barbara, killing 7 people, including himself. Upon hearing of his alleged motive, my friend Gail mentioned something our yoga teacher, Kquvien, has often iterated: desire is the root of unhappiness. As soon as Gail said the aforementioned, these words of Marx’s that were imparted to me through the eloquent vessel that is Barbery, began to chime in my psyche and have been ringing there ever since. When one clings to deleterious desire, the outcome is oppression of one’s soul. Oppressors are most often the oppressed. Little did I know that in the video Rodger apparently released prior to his killing spree, he had categorically stated that he felt he had suffered “an existence of loneliness, rejection and unfulfilled desires.” That his intense desires could drive him to such lengths is, sadly, unsurprising to me. William Potter: Ooh! It damn well ‘urts! William Potter: What’s the trick then? Invariably, however, as one practices coping with disappointment, one is less easily thrown into fits of anguish when ones expectations of life are not met . Life is a cycle of pleasure and pain. To move through life gracefully, it behooves us to learn to experience these dichotomies without drinking them in to the point of intoxication: rather, we should let them wash over us, leaving behind whatever residue they will without corroding the soul. And always, we should be thankful for them. Polemic though some of Camus’ ideas may be, the central tenet of his sentiments is one that resonates with me: acceptance of the absurdity in life is the first step in taking charge of one’s own fate. Paradoxical indeed– accepting that life throws boulders on our shoulders in a cyclical dance between desire and destiny enables us to take charge of that very destiny as that acceptance leads to contentment even as we struggle up the proverbial cliff. “The [repetitive] struggle itself toward the heights” is all in all what life is and life in and of itself is indeed “enough to fill a man’s heart”. Finding happiness in The Struggle is part and parcel of the struggle and, in a mise-en-abyme-esque way, one must imagine oneself happy if one accepts the challenge to take on the struggle until one’s light is snuffed out. 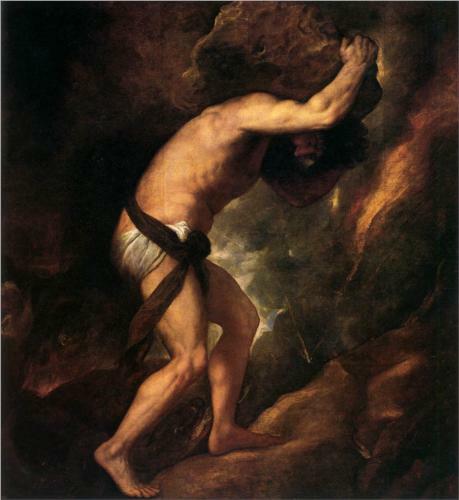 If Sisyphus begrudgingly heaves that rock up the hill, constantly bemoaning his fate and filled with a bilious desire for a life other than his own, he too would have harvested a bitter oppression of his own cultivation. It’s a bromide, but it is a truth: our happiness is our choice; our happiness is our creation. We are at once infinitesimal, powerless and powerful beyond all measure.